242 pages | 19 B/W Illus. Today, there is growing interest in conservation and anthropologists have an important role to play in helpingconservation succeed for the sake of humanity and for the sake of other species. Equally important, however, is the fact that we, as the species that causes extinctions, have a moral responsibility to those whose evolutionary unfolding and very future we threaten. This volume is an examination of the relationship between conservation and the social sciences, particularly anthropology. It calls for increased collaboration between anthropologists, conservationists and environmental scientists, and advocates for a shift towards an environmentally focused perspective that embraces not only cultural values and human rights, but also the intrinsic value and rights to life of nonhuman species. This book demonstrates that cultural and biological diversity are intimately interlinked, and equally threatened by the industrialism that endangers the planet's life-giving processes. The consideration of ecological data, as well as an expansion of ethics that embraces more than one species, is essential to a well-rounded understanding of the connections between human behavior and environmental wellbeing. 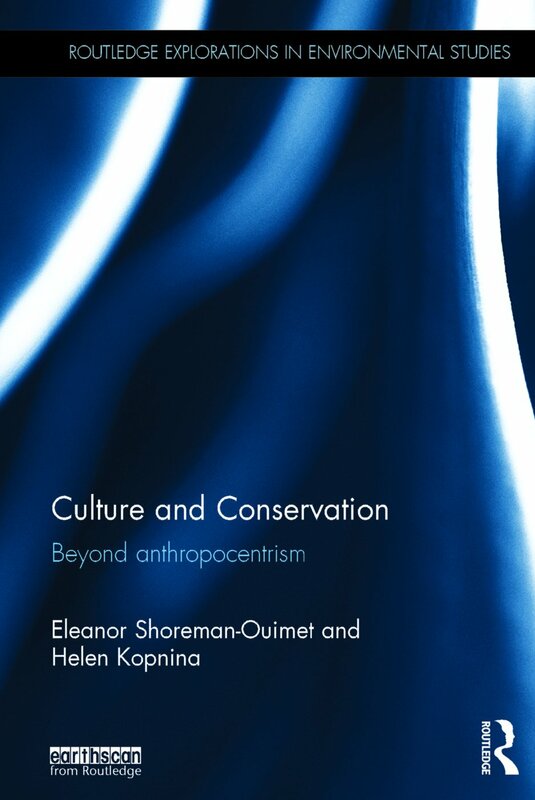 This book gives students and researchers in anthropology, conservation, environmental ethics and across the social sciences an invaluable insight into how innovative and intensive new interdisciplinary approaches, questions, ethics and subject pools can close the gap between culture and conservation. Eleanor Shoreman-Ouimet is an environmental anthropologist and currently teaches in the Department of Anthropology at the University of Connecticut, USA. Her research focuses on human-environment interactions, cross-cultural conservation practices, community response to natural hazards and the effects of climate change. Helen Kopnina is currently lecturer in anthropology and development and environmental anthropology at the Leiden University, the Netherlands. She is also a coordinator and lecturer of Sustainable Business program and researcher in the fields of environmental education and environmental social sciences at The Hague University of Applied Science, the Netherlands.